I won a signed copy of this historical tale from none other the than the Middle Grade Mafioso himself, Michael Gettel-Gilmartin. 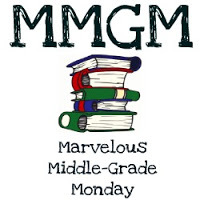 You can find him dishing out middle grade wonders on his personal blog or group blog Project Mayhem. Both will be worth your time as the Mafioso not only protects you, but he makes sure you hear about the best in MG.
He’s found a good one with WRITTEN IN STONE. Told from the perspective of Pearl, it begins with her as a great-grandmother, but soon flashes back to 1923 when she was 13 years-old. It’s a tough life as a member of the whale hunting Pacific Northwest’s Makah tribe. This was not something I was not familiar with and the words Rosanne Parry wrote brought this world vividly into my mind. Although the first half of the book is world building about a time and people most will not know, it’s when Pearl makes a hasty decision that ramps up the tension meter ten fold. A real page turner. A rich discussion could take place with the topic of how women were often limited in the roles they could take for a career or in a family. Quite a jolt to see how it was and sad to see it hasn’t changed in parts of the world today. I enjoyed learning about ‘drumming’ and how it served so many purposes. The author as a former teacher wrote this for her students who asked “Why is the story never about us?” She lists their names in the dedication. It took some time, but now they have their story. For me the novel was a beautiful reflection, a snapshot of life in the Makah tribe and how people tried to exploit it. The author’s notes and glossary are filled with insights. It might even be a good idea to read this first. Grandma lifted my chin. “When you write a word down, you own that word forever,” she said. This entry was posted in Reviews and tagged Middle grade, Middle Grade Book Reviews, Rosanne Parry, Written in Stone. Bookmark the permalink. Sounds like a great story about a different part of our world. And sad how women’s roles are so limited in many parts of the world. Sounds like a lovely and interesting story. I was interested in this when I saw it on Michael’s blog. Now I’m moving it up my TBR list. Thanks for the reminder. 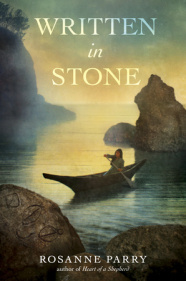 I loved Written in Stone (I reviewed it back in March). And your favorite line is also my favorite line (in fact, it’s in my queue of Great Quotes from Children’s Books — just haven’t scheduled it yet!). Wonderful review–and thanks for the compliments for the Mafioso. The Don’s always glad of a good word. Thanks for stopping by, Rosanne. I appreciate the links to the beautiful setting from the story. I’m anxiously awaiting your next book. Best of luck. I read this last year and really enjoyed it. I’m a huge fan of Rosanne’s books, and the part where she dedicated it to her students brought tears to my eyes. She visited my library last year. It was a real treat to hear the background behind this story and her others. I love the sound of this book. And that cover is beautiful. I haven’t heard of Rosanne, so thanks for introducing her here. And thanks for visiting the Write Game! What a surprise today was with that Blitz. this sounds incredible. That favorite line you mentioned cinched it for me. Must read.